George Mason University’s School of Art and African and African and African American Studies Program are proud to host Doreen Garner: Full Body an exhibition of the Brooklyn-based artist’s seductively-crafted and provocatively grotesque sculptural objects. Made from a diverse array of materials including hand-blown glass, silicone, swarovski crystal, hair, and anatomy books, Garner’s work is materially and visually arresting, while purposefully confronting the dark spectres of atrocity associated with the objectification and dissection of the black female body in the history of medical experimentation. Doreen Garner (b.1986) is a Brooklyn-based artist born in Philadelphia, PA. 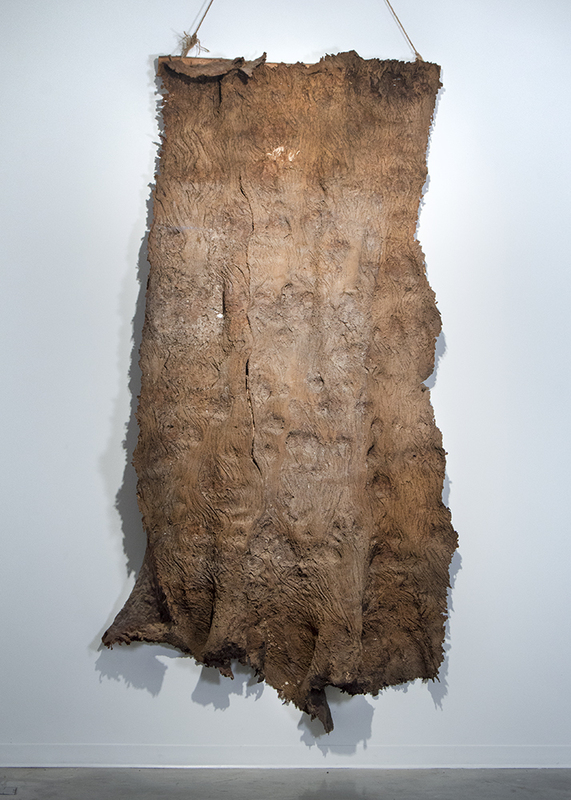 Her work has appeared in national and international exhibitions at venues including Knockdown Center, Queens, NY; Antenna Gallery, New Orleans, LA; University Museum of Contemporary Art, Amherst, MA; Chrysler Museum of Art, Norfolk, VA; Vox Populi Gallery, Philadelphia, PA; Rhode Island College’s Bannister Gallery, Providence, RI; Cindy Rucker Gallery, NY. Garner has been awarded residencies at Pioneer Works, NY; Toledo Museum of Art, OH; Abrons Art Center, NY; S12 Glass Studio, Bergen, Norway; Lower Manhattan Cultural Council; and Skowhegan School of Painting and Sculpture. She holds a BFA in Glass from the Tyler School of Art at Temple University and an MFA in Glass at the Rhode Island School of Design. She is current in residence at Pioneer Works in Brooklyn, NY. 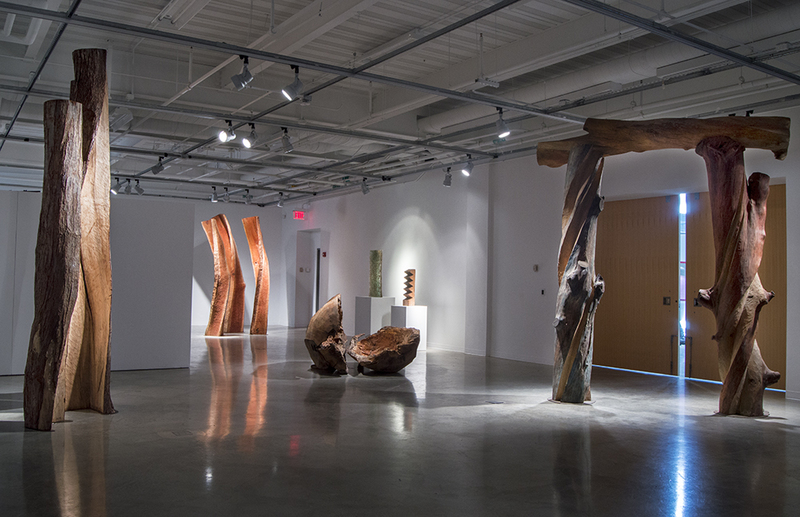 Emilie Brzezinski: Natural Fact is a survey of the Virginia sculptor’s 40 year career. 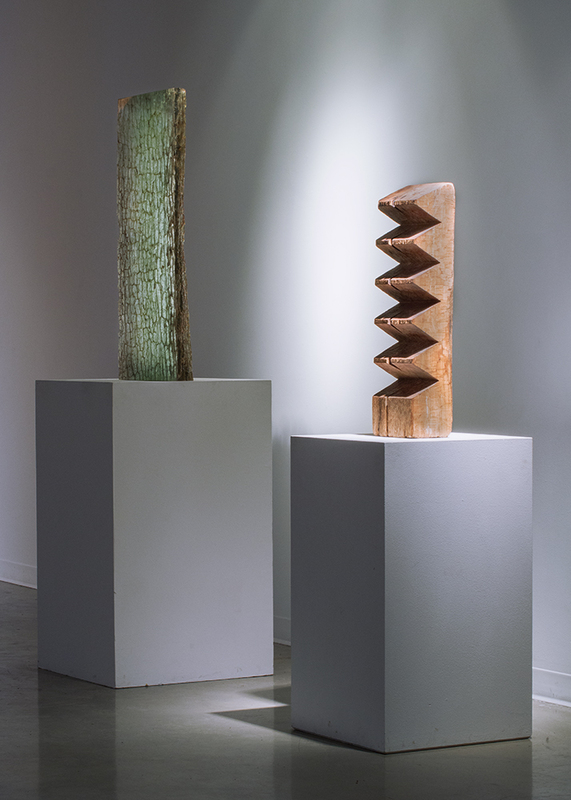 Brzezinski is best known for towering arrangements of twisting chainsaw carved tree trunks which exploit the modernist maxim “truth to materials” to surprising expressive effect. This exhibition brings together examples of her signature tableaux alongside works from earlier periods in materials such as latex and resin. “Much of the material that has gone into the creation of this show originated in Virginia and so it’s a pleasure for me to display the work here, especially at an up and coming university that places value in the arts.” Brzezinski said. 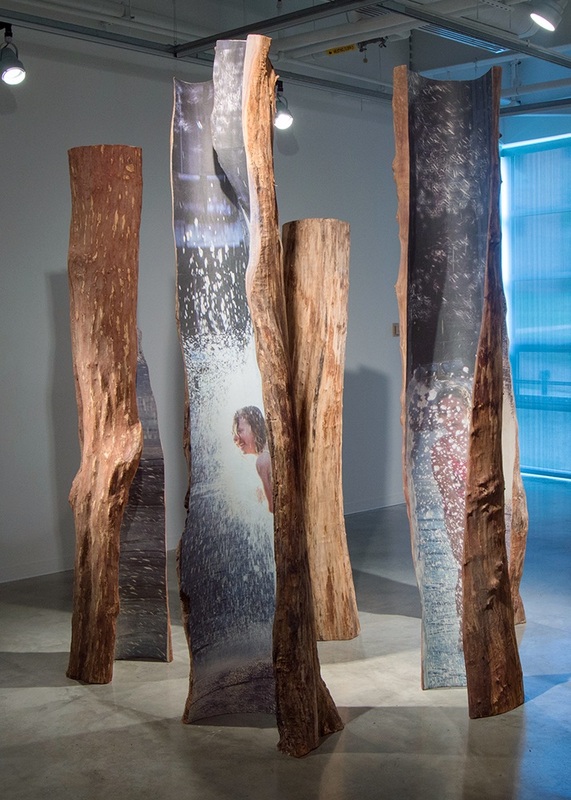 One sure feature of the show will be High Point, a monumental 15­foot oak that greets visitors just outside the gallery’s already seemingly large barn sliding doors. Another highlight will be Children’s Arch, a nearly 12 ­foot tall gateway sculpted from three trunks of gum wood; Brzezinski created the arch in 1991, yet this is its first public exhibition. Born in 1932 in Geneva, Switzerland, Emilie Benes Brzezinski immigrated to the United States and grew up in California. She graduated from Wellesley College with a degree in Art History in 1953. Brzezinski began her art career in the 1970s working with a variety of media, including resins, latex, and wood fiber. Her expressive themes always related to nature. 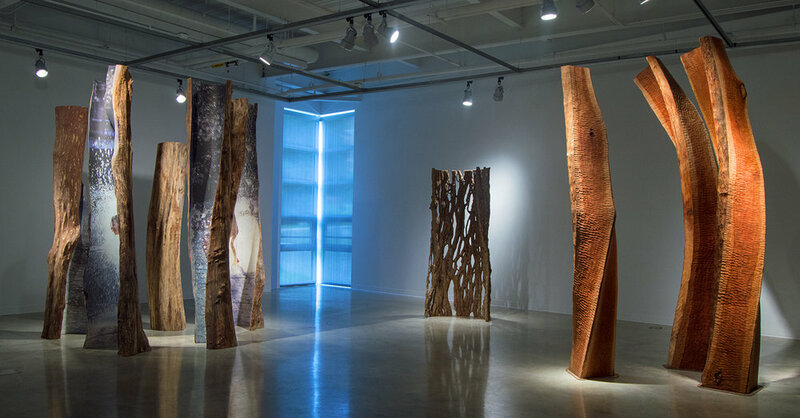 Eventually, she shifted focus to creating monumental wood sculpture, using a chainsaw and ax to carve towering forms that breathed new life into felled trunks. During the last two decades, Brzezinski has had several gallery and museum installations both in the United States and overseas. Many of her works are in the Czech Republic, the country of her family's origin. There, Prague Titans gazes upon the Vltava River, and a more restrained installation, Broken Blocks can be seen in the National Gallery in Prague. In the United States, her bronze Arch in Flight stands just two blocks from the White House in front of the Federal Reserve building on New York Avenue, and her most monumental work to date, Lament, greets visitors in the front circle of the Kreeger Museum. Outside the nation's capital, Brzezinski sculptures can be found in Chicago at The Society for Arts as well as in New Jersey at the respected Grounds for Sculpture park. Brzezinski continues to work in her Northern Virginia studio that she built in the 1980s.